Accelerating Social Innovation, Dotforge Accelerator’s conference on the role of accelerators in supporting social enterprise and social venture startups brought together leading voices from the U.K.’s social enterprise community and startup entrepreneurs for candid conversation, debate, and valuable networking opportunities. Panels chaired by RSA Fellow Adrian Ashton, Dotforge’s Tobias Stone, Social Enterprise Acumen CIC’s Kate Welch, and UnLtd’s Steven Leach discussed the role and need for social enterprise, how accelerators can boost social innovation, inspiring the next generation to take on social enterprise and the strategies and barriers to social investment. Creative enterprising solutions as varied as peer-to-peer postgraduate loan mechanisms (StudentFunder) to integrated Diabetes apps (We Love Life.) were showcased to demonstrate the breadth and versatility of social enterprise and its crucial role in the U.K. Contributors from Canada, Mexico, and from across the U.K. reminded attendees of the importance of social enterprise across the globe and international partnership and cooperation opportunities. The conference opened with an address from Dotforge highlighting the key advantages of accelerators for tech startups, particularly social enterprise. Accelerators foster a culture of participative product development and provide great opportunities for mentorship and knowledge sharing. Local entrepreneurs who donate time to provide mentorship within accelerators find the experience deeply rewarding. They draw on the creative spark and enthusiasm of startups to enhance their own ventures while reminding themselves of their own beginnings, core purpose, and values. Sam Tarff from Key Fund spoke of the long history of social enterprise, monasteries in the middle ages for example, and the shift in perception from a fringe activity to a legitimate form of organization. Social enterprise values are influencing the private sector (think triple bottom line) more and more remind the business world of the importance of risk taking, troubleshooting, and creativity in problem solving. He concluded by stating that the challenges of the most challenging communities cannot be met with top down initiatives, enterprising thinking must be the driving force for social change. The opening panel of Kate Ebbutt (Patient Opinion) and Hugh Rolo (Locality) discussed emerging technologies and social innovation. Patient Opinion is using the changing technological landscape to connect patients with each other and health care providers, helping to shift power dynamics and empower its customers. A true social enterprise success story, Ebbutt recounted the early struggles, successful expansion and advised on how growth should not mean parting with core values. Rolo provided wisdom throughout, saying, “we’ve cracked material, the future is in how we look after each other, a service-based space that social enterprise can fill like no other.” The panelists agreed social enterprise focused on aging, dementia, diabetes, depression, and serving the “underbanked” are needed and areas of opportunity for both profit and social change. Early warning mechanisms, intervention and cleverer preventative action all need exploration and enterprising thought. Opportunities can also be had dealing with big data, given the amount of public information that exists. At present, almost all requests to government come from the private sector. How can social enterprise mine this data for social innovation? Overall the first panel told the audience that the virtues of social enterprise as a concept alone are not enough, a strong business model, ambition, reading the landscape and smart growth are crucial to success. Panel number two was equally engaging, with Dotforge moderating a discussion with Juan Gerra of StudentFunder, a social enterprise designed to fill a true void in the postgraduate student loan space in the UK. It was refreshing to see such a young entrepreneur find success by fulfilling a real need and a gap in the market. There had been no real support from banks or government in the form of loans to masters and doctorate students, so Guerra developed a very attractive loan system funded by investors and philanthropists, and crucially, did so with the help of an accelerator. The discussion then veered into comparing accelerators with incubators, the difference being in the name really, as opinion was largely that incubators need entrepreneurs in the building paying rent, whereas accelerators relying on equity want to see their entrepreneurs out the door as soon as possible, making waves in the market. Many accelerators have entrepreneurs-in-residence, and ideally these would be six months to one year ahead of the startups, who could then visualize their progress and see where they could be in just a short period. The mistakes and lessons learned would be fresh in the memory of the EiRs, allowing them to help startups avoid repeating errors and see how it’s possible to persevere and overcome initial slipups. The third panel chaired by Kate Welch OBE, director of Social Enterprise Acumen CIC, centered on youth and technology, the future landscape of startup social enterprise and the associated challenges felt by young entrepreneurs on the panel. 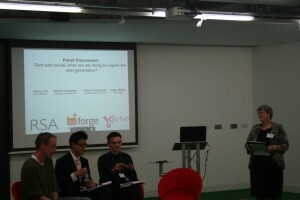 The panel, consisting of Darren Chouings of the University of Sheffield, Johnny Luk of the National Association of College and University Entrepreneurs, and David Thompson of startup Yoomee discussed why young people are turning to social business and social enterprise as a form of social action. Why is it a convincing career choice? Social action is often a moral choice, but since many young people are not in a place financially to make take other forms of social action are increasingly turning to social enterprise, allowing profit to fund their mission of social change. The panel praised volunteering as a way to spur young people onto social enterprise, citing social entrepreneurs who found their idea, purpose or important contacts through volunteering. Lastly the panel asked how we incorporate entrepreneurial training and social enterprise education into curriculums and graduate schemes? At what level of education should the pillars of social enterprise be introduced? Opinion varied, some thinking pupils as young as primary school level should be introduced to the idea of using business as a way to combat social challenges, with sustainability and environmentalism crucial to future models. The day closed with a panel discussing social investment, common pitfalls of entrepreneurs approaching investors, grant funding versus loans, crowdfunding, and more. Sam Tarff and Dave Thornett of Key Fund, Kevin Lloyd-Evans of The Big Issue Newcastle and Steve Leach of UnLtd began a bit differently than previous panels, with a brainstorming session of investment key terms, including risk, intangible profits, investment readiness, too small or too big, and finding the middle ground as you grow. The key lesson from the discussion was to know what you need and why you need it, then go shop around. Going for money because it’s there can seem like a no brainer, but it’s the panels advice was to know what you want it for and how you will spend it in the short term. A panelist asked “If I gave you a million pounds what would you spend it on on Monday?” Having a clear answer before approaching investors is the heart of a successful pitch. Having seen many pitches in the past, the panel articulated what they would most like to see from social enterprise startups. Have clarity of vision. Be aware of language. Avoid business speak, be clear about barriers to success, make sure the numbers match that story, and in terms of cashflow projections, articulate your presumptions. When placing a cashflow statement on the table, make sure it’s not a P&L or mixture. With a broad range of topics and panelists, it was clear that attendees left the conference with added wisdom and enthusiasm, inspired by the creativity and determination of their fellow social entrepreneurs. Dotforge deserves a big thank you from Social Enterprise Acumen CIC for the invitation and allowing our director Kate Welch to chair an exciting discussion. We look forward to monitoring the success of all of the social entrepreneurs present and incorporating the lessons learned in our work finding, guiding, and coaching social entrepreneurs in the North East.